A late 19th century Liberty & Co. inlaid table or coffee stool of octagonal shape in excellent original condition. The top consists of inlaid decoration of mother of pearl and various exotic woods to create a decorative geometric design. 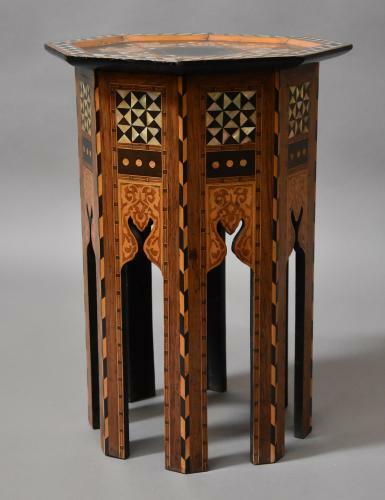 Each of the side panels has a geometric design inlaid with mother of pearl and exotic woods with an inlaid wood decoration below with a line design between the panels, the shape of the legs give the table an architectural influence from the East. Liberty & Co developed decorating rooms in an 'oriental' style in the 1880's and exhibited various items with styles from Exotic countries. The first Liberty catalogue known to exist was produced in 1881 and this celebrated Oriental items and also set the fashion for the store for many years. Examples of these stools from Liberty & Co. can be seen in the book: 'Liberty's Furniture 1875-1915, The Birth of Modern Interior Design' by Daryl Bennett, pages 28,29,30 etc. This stool/table is of excellent condition and can go straight into a home.